The skin around your eyes is the thinnest and most sensitive part of your face. It’s where your real age reveals itself first and where every sleepless night becomes visible. Even if you have an excellent facial moisturizer, it still doesn’t mean it’s the right cream for the skin around your eyes because it can contain certain irritants. 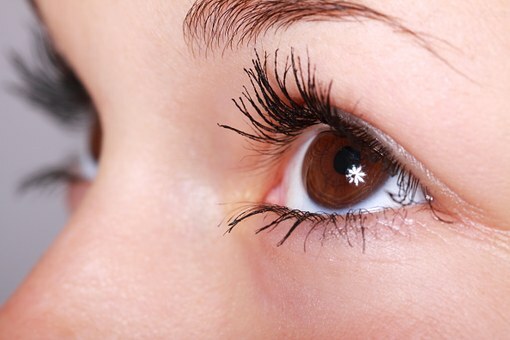 Creams or serums made specifically for the sensitive eye area are gentler. They usually have emollients that keep the moisture, and peptides, which stimulate collagen production. But be careful if you’re using anti-age creams containing acids such as retinoids because they can also irritate the skin. If you remove your makeup on daily basis, you need to be aware of the way you’re doing it. Don’t tug it harshly and press too hard, but try something else – soak a cotton pad into alcohol-free makeup remover and hold it over your closed eye for some 30 seconds, then slowly drag the pad in the direction of the lashes. Generally speaking, avoid any unnecessary force when applying a product around your eyes. It’s best to use the point of your ring finger or your pinky when putting on a cream. And always pat the skin, don’t rub it. Yes, the sun is something you should be careful about, even though your skin needs it to produce vitamin D. Each time you’re going outside, put on a facial sun cream and sunglasses. If it’s too hot, consider wearing a wide-brimmed hat, too. There are also various eye creams that contain SPF, so you can nurture the skin and protect it from the UV radiation at the same time. Here’s a great piece of advice: keep your eye care products in the fridge. This way, the cooling effect will feel great on your skin when you apply the product. And what’s even better – it will help the skin depuff. Sometimes, our usual morning routine is to hide under-eye bags and accent our eyes. That’s why Lash Blossom eyelash extensions Sydney based experts suggest that before you put on your makeup or the extensions, first apply a cooling product or an eye roller to remove those hateful bags. If it ever happens that you run out of a certain product in the moment of need – no worries! Open your fridge and use the power of natural products. Eye puffiness can be easily removed if you apply cucumber slices on your eyes. There is other useful stuff in your kitchen for baggy eyes – try putting green tea bags or potato slices. Nature is full of surprises, right? Not getting enough sleep will soon reflect on your face, you know this far too well. So, discipline yourself into getting the recommended amount of sleep every night. Also, try to avoid sleeping on your stomach or on your side because it makes the blood and fluids concentrate around your eyes. Another way of preventing it is to keep your head elevated while you sleep. Ok, bad habits such as smoking or drinking alcohol are damaging to you for many reasons. No need in listing all of them, but let’s just concentrate on how they affect your skin. First of all, smoking speeds up the aging of your skin. No matter how old you are, you will look older if you are a regular smoker. Alcohol drinks should be avoided because they dehydrate your skins, so it will lose its flexibility much sooner and start developing unnecessary wrinkles. Instead of alcohol, better drink regular water as much as you can and help your skin.